The winter blahs have set in and we’re less interested in cooking dinner. Instead, we’ve been cooking a big batch of something on the weekends and using it through the week. We’ve done a series of soups, lasagna, and a giant pork loin. Dinner is easier when part of the meal is done – you only have to prep side dishes. So, we found this recipe for pizza dough that fits this approach. Make a big batch of dough, keep it in the fridge, and use it piecemeal during the week. I thought I’d try it, and the results were great. 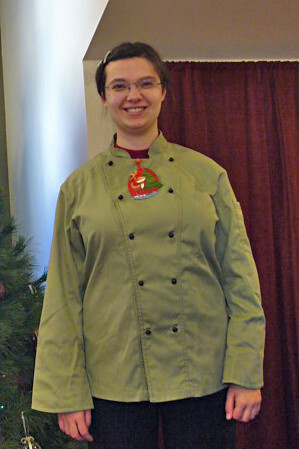 Tess Grubbins in her new kitchen uniform. smoked salmon – 1 ½ by 3” piece of fillet, shredded. It’s a strong flavor, so go easy. Optional – dill (or artichoke hearts) something acidic to brighten the flavor. Take ½ pound of the dough and shape it into a crust. Par bake a thin crust, lightly brushed with olive oil, for 5 minutes at 400 degrees F.
Add toppings – cheese first. Bake for 10 – 12 minutes, until crust is golden brown and cheese is bubbling. Heat olive oil in a large frying pan over medium head and add the onion (sliced thin) and stir to coat the onion. Reduce heat to medium low, cover and cook, stirring occasionally until the onions are soft and have just begun to color, about 30 minutes. Remove the lid, salt and pepper to taste, increase heat to medium, and cook uncovered, stirring frequently, until the onion is deep golden, about 25 minutes. Add garlic and sausage slices to the onions. Place over high heat, stir in the wine (sweetens the mixture) and cook, stirring constantly, until the wine is reduced but the mixture is still moist, (add optional parsley) about 3 minutes. Roll out dough into a thin crust. Brush with olive oil and par bake 5 minutes at 400 degrees F.
Add toppings – cheeses first (use half the parmesan), then onion mixture, and drizzle the edges of the crust with olive oil. Place in the oven to bake at 400 degrees F. Remove when crust is golden brown (10-12 minutes) and add the remaining parmesan, red pepper garnish, and drizzle a little olive oil on top. Sam might need a haircut. Chop cabbage and saute over medium heat in the sesame oil. Once it has softened, add the vinegar and cook it down till its gone, but still moist. While it’s cooking, stir fry the chicken in another pan until cooked through. Remove from heat and set aside. 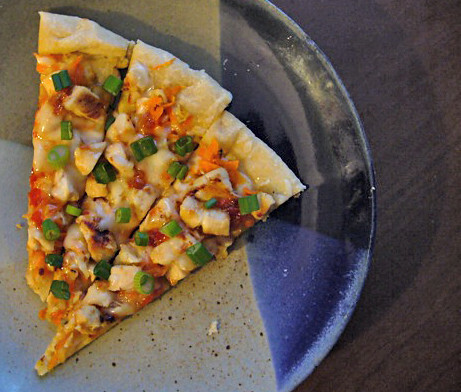 Par bake a thin crust, lightly brushed with sesame oil, for 5 minutes at 400 degrees F.
Add toppings – first, the cabbage, then chicken, cheese, and carrot. Sprinkle the chili sauce over the top, then the green onion and crushed peanuts. 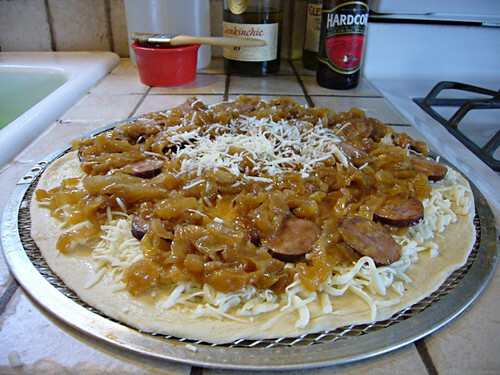 Everybody likes pepperoni, and when you’re making your favorite pizza its easy to overdo it on the toppings. The key here, is to strike a balance between pepperoni, cheese, sauce and crust. Heat the oil in a skillet, and saute the garlic until fragrant. Add the tomatoes with liquid, tomato paste, a pinch of red pepper flakes and the dried herbs to taste. Bring to a lively simmer and cook, stirring occasionally until the juice has evaporated (~15 minutes) and the sauce is nicely reduced. Add salt if desired. Makes about 2 cups. 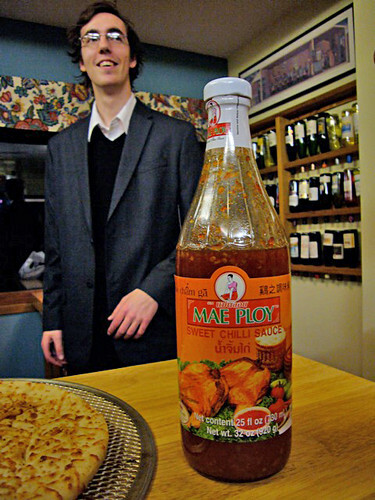 Can be stored in the fridge up to 5 days, or frozen indefinitely. Note: if you over-top the pizza, the crust will burn before your toppings are done. Balance is key. And for more pizza ideas click here. I love this idea of stretching pizza dough over a whole week’s meals. And all of your pizzas are so unique, it wouldn’t get boring at all. Very cool! Thank you for your kind words Kocinera!